Today was the first day of Connor and Tyler's MDO program. This is also known as my sanity break. AND ALL THE ANGELS SANG THE HALLELUJAH CHORUS. 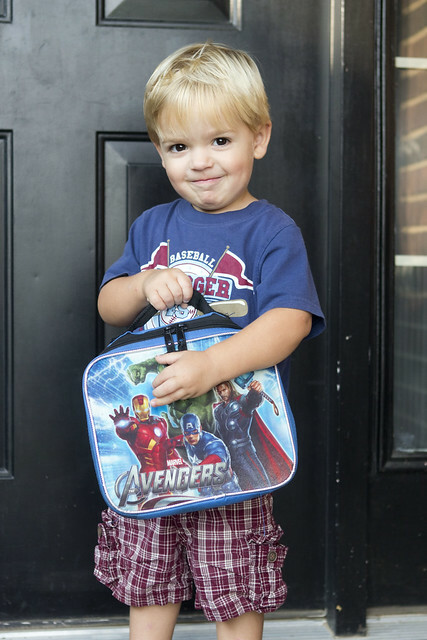 Connor and Tyler were both so very excited this morning when they saw their lunch boxes packed and ready to go. The hardest part is waiting between the time of dropping Brayden off and their own school starting. The waiting is oh so hard. 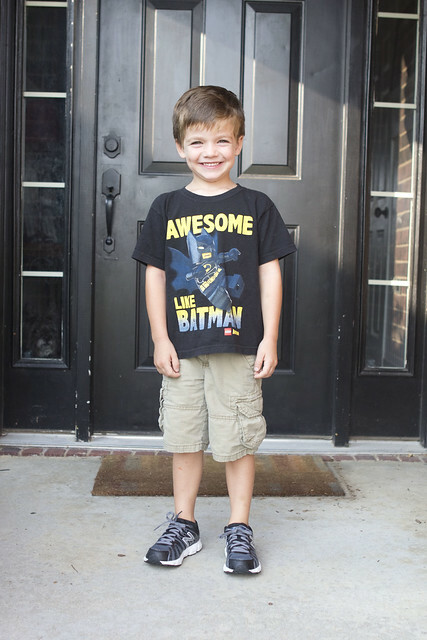 I can't believe that this is Connor's last year in preschool. This morning he walked into his classroom, put his stuff in his cubby and then sat down to do his work. I asked if I could have a hug and he laughed as if he was embarrassed and said no, before resuming his work. It's a shame he's so emotionally attached to me. 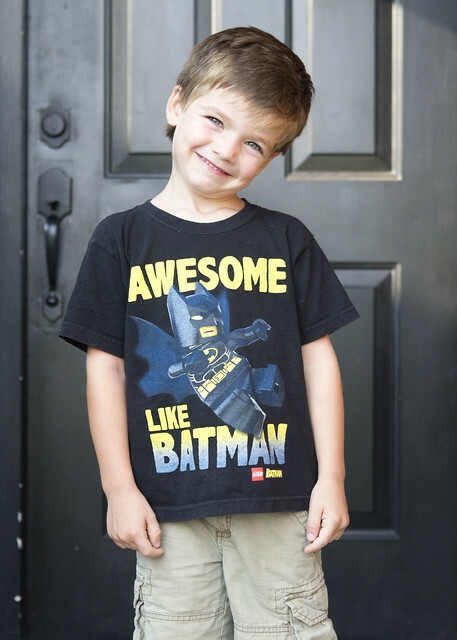 last night as we decided on what he would wear he chose the batman one. 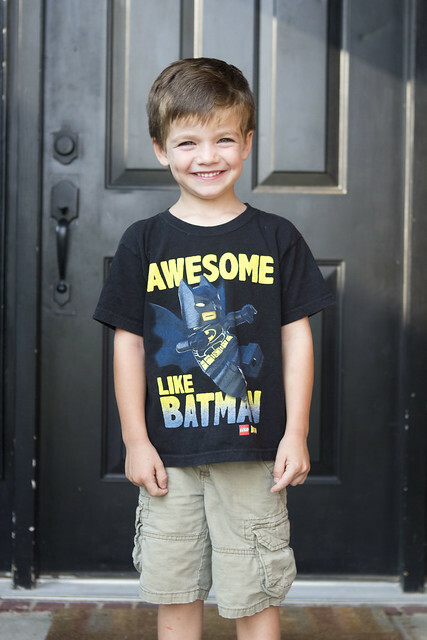 At first I was hesitant (I am weird with kids clothes, which is surprising considering I normally look like I just rolled out of bed), but then he said "I just need this shirt because I really am awesome like batman, mom!" Couldn't say no the the awesome kid (see also: no one will ever be able to accuse my kids of not having self confidence). Connor is really one of the sweetest boys you'll ever meet. His heart is as big as a lion's, and he is constantly seeking out how to help others. Can't wait to see how much he learns and grows this year! And this stinker. He HAD to hold his "blue other pack pack" during his picture. 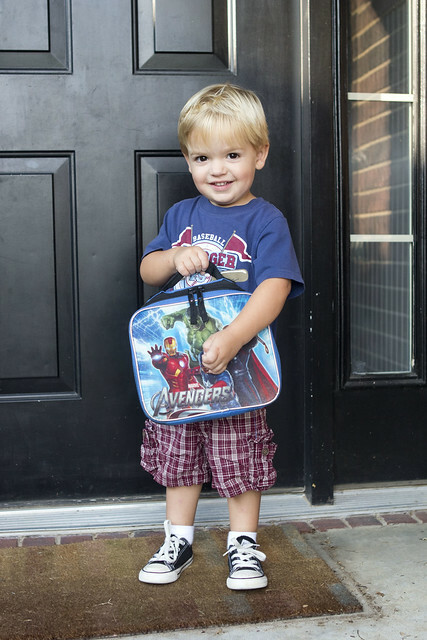 He got the hand-me-down lunch box this year. He was most excited about the hammer on it (Thors gavel). I asked him to put his hands in his pockets (it's easier to take pics of him if his hands are preoccupied). He couldn't find his regular pockets so he put them in his cargo pockets. He is HILARIOUS. I was a little nervous he'd have a melt down as I left since he was a little emotional about being at school during open house. But he walked right in, started playing and didn't even look back when I told him good-bye. I was able to be productive today, and my house stayed clean upon it being clean, which is always a refreshing feeling. Tonight I was reminded about how quickly these baby and preschool years are fleeting... I happened upon some old pictures and video I had no idea were still left on a memory card. They are of Brayden when we first moved into our current house (about 3.5 years ago!). He is SO little and precious and he says words incorrectly and has a speech delay that at the time freaked me out but now I just think is the most endearing thing ever. I don't have a ton of regrets in parenting, but I think the biggest one is that we have never owned a video camera. It just kills me to think of all of the memories that we have missed in preserving. So obviously I am taking my emotional unrest on my babies growing up to research video cameras. If you own one, leave a shoutout in the comments if you would recommend yours! And if you don't, join my boat. We can't all be regretting this when we're in nursing homes in 40 years.